HARREVELT - Suite de Perou Audience de Charcas. HARREVELT,E.van/ CHANGUION,D.J. - Suite de Perou Audience de Charcas. Suite de Perou Audience de Charcas. - HARREVELT,E.van/ CHANGUION,D.J. 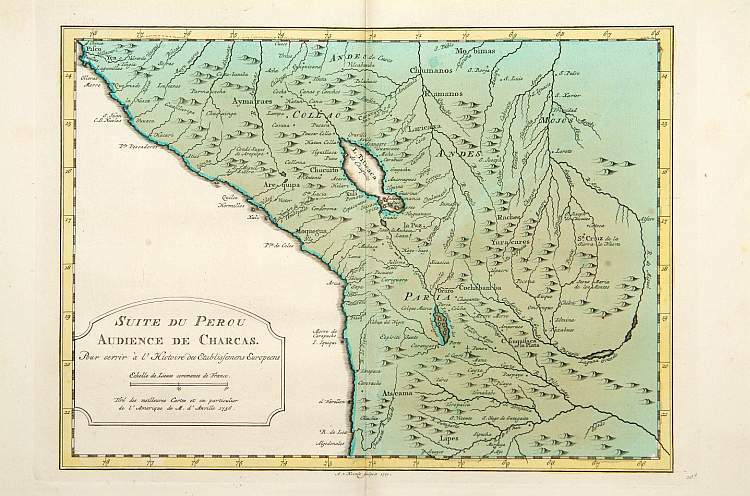 Title : Suite de Perou Audience de Charcas..
Map maker : HARREVELT,E.van/ CHANGUION,D.J.. Size : 8.5 x 11.8 inches. / 21.5 x 30.0 cm. Description :"Uncommon edition of this accurate map showing the Peruvian coast, the ranges and villages of numerous Indian tribes are shown. From Atlas Portatif pour servir a l'intelligence de l'Histoire Philosophique et Politique des etablissements et du commerce des Européens dans les deux Indes. After Jacques Nicolaas Bellin (1703-1772) who was one of the most important and proficient French cartographers of the mid-eighteenth century. He was appointed the first Ingenieur Hydrographe de la Marine, and also Official Hydrographer to the French King. With French text in title cartouche and an additional title in Dutch underneath the map.